Since Nokia stopped upgrading old school S60V5 devices, People are bored of old look their device carry. 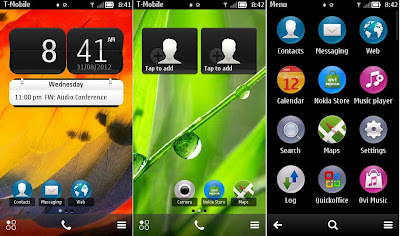 They want to spice up the look and thats why they try themes, launchers and other such things to enhance the interface, Such an app which can really help people to customize the look of their device is SPB Shell. I've written about SPB Shell many times in the past and I've received great response But today we will not talk about SPB Shell, Today I'll introduce you with a new app called Belle Shell. Belle Shell is somewhat similar to SPB Shell the difference is that belle shell helps people run Symbian Belle on old devices. Belle Shell was developed by Ilko Tsenov. 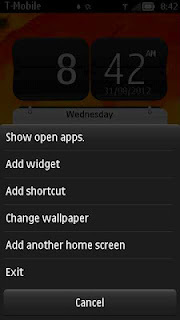 It has a launcher with about 6 screens where you can put shortcuts to your Favorite apps and widgets on home screen. The widgets include a digital and analogue clock, contacts, calender etc. With Belle Shell you also get a pull-down panel where you can have quick access to Wi-Fi, Bluetooth, Silent profile, LED Flash etc. Nokia 5800 XpressMusic, Nokia 5530 XpressMusic, Nokia 5230, Nokia 5233, Nokia N97, Nokia N97 mini, Nokia C6, Nokia X6 and other Symbian S60v5 phones. Before you can Install Belle Shell, Your Device must have Qt and Qt mobility. If you don't know whether your device has Qt and Qt mobility or not then here is a method to check. Download and Install Qtinfo on your device. Launch program, If you do not have Qt libraries Installed the program will show error message "Failed to start QtInfo (-1)" and If your device have Qt libraries the program will run and display report about Qt versions. Once the above file is installed, Download and Install Qt Mobility from this link. Once you have the required Qt and Qt Mobility, You are ready to run Belle Shell on your S60V6 Device. Just Download Belle Shell from the given link and Install it on your device. If the Above Download Link doesn't work then Click here. Hope you guys liked this post, Please leave your comments below and let me know. You can also ask for help if having problems.